"Salmon Falls River Estuary, Spring" . oil . 15" x 30"
"Salmon Falls River Estuary II" . oil . 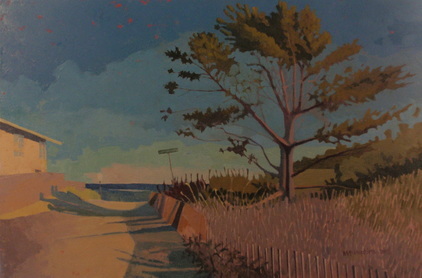 8" x 17"
"Beach Fence, Winter" - oil - 30"x24"
"Beach Cottages III" . oil . 8" x 10"
"Beach Cottages II" . oil . 8"x8"
"Ogunquit, Riverside" . oil . 36"x24"
"As It Ever Was" . oil . 48"x24"
"Estuary" - oil - 10"x20"
"Commercial Alley" (Portsmouth, NH) - oil - 10"x20"
"Camden Falls" - oil - 14"x14"
"Beach Rocks II" - oil - 8"x22"
"Beach Rocks" - oil - 20"x20"
"Old Port II" - oil - 12"x22"
"Memorial Bridge, Kittery/Portsmouth" - oil . 16"x12"
"Lifting Fog, September" - oil - 14"x11"
"Ogunquit River, Autumn III" - oil - 21"x12"
"Marginal Way III" - oil . 24"x24"
"View Through Trees" - oil - 8"x8"
"In Maine III" . oil . 24"x20"
"At Ogunquit II" . oil . 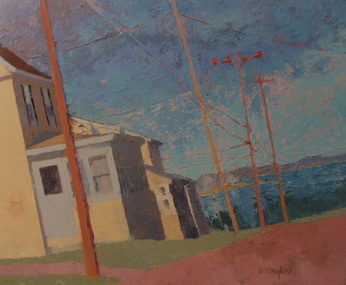 24"x12"
"View at Drakes Island Road" . oil . 12"x 12"
"The Sea at Ogunquit II" - oil - 30"x 15"
"In Maine II" - oil - 24"x20"
"By the Sea" - oil - 12"x12"
"Blue House by the Sea" - oil - 36"x24"
"View at Marginal Way IV" - oil - 24"x12"
"Parson's Beach" . oil . 26" x 26"
"Hillside, October" - oil - 12"x12"
"At Ogunquit" - oil - 36"x24"
"View at Marginal Way" - oil - 24"x20"
"View at Old Point" - oil - 10"x10"
"Pines and Clouds, Ogunquit" - oil - 20"x24"
"Tidal Water" - oil - 36"x24"
"Portland Lobster Bar" - oil - 14"x11"
"Beach House, February" - oil - 20"x20"
"Sea at Moody" oil - 12"x12"
"Reflection at Otter Cove" . oil . 20"x 20"
"Village by the Sea" - oil - 36"x24"
"Tidewater" - oil - 12"x12"
"Sullivan House" - oil - 24"x20"
"Hidden View" - oil - 24"x36"
"Beach Houses" - oil - 24"x20"
"Sea Weathered" - oil - 8"x8"
"Salt Water Farm" - oil - 20"x16"
"Portland Pier" - oil - 11"x14"
Reflection at the Cove" - oil - 24"x 20"
"At Otter Cove" - oil - 12"x12"
"Dunes" - oil - 24"x24"
"Sea Path" - oil - 8":x10"
"Winter Sea II" - oil - 36"x24"
"Sea Rose" - oil - 12"x12"
"Ogunquit River, Autumn" . oil . 26" x 14"
"Moody Pond" - oil - 24"x36"
"Beach Tree II" - oil - 24"x20"
"House on Littlefield Road" - oil - 30"x40"
"Winter Sky and the Sea" - oil - 40"x30"
"Winter Light II" - oil - 11"x14"
"Salt Marsh" - oil - 30"x40"
"Winter Tapestry" - oil - 24"x12"
"House & Barn" - oil - 24"x36"
"Winter Sun II" - oil - 20"x24"
"Winter Shadows" . oil . 16" x 16"
"Winter Beach" - oil - 9x12"
"Cape in Autumn" - oil - 12"x12"
"River Near Damariscotta" - oil - 18"x14"
"Mountain View" - oil - 8"x10"
"Old Port, Autumn" - oil - 11"x14"
"Ogunquit Beach, Winter" oil - 18"x18"
"Shadows on Snow" - oil - 8"x8"
"Orchard in Spring" - oil - 36"x24"
"Barn at Tidewater" - oil - 8"x8"
"Farm Road at Tidewater" - oil - 8"x8"
"Winter Shadow" - oil - 12"x12"
"At the Sea" - oil - 12"x12"
"The Clearing" - oil - 12"x12"